A designer makes choices. When it comes to book design, he or she is likely to decide on typography, grid system, editing, binding, format, print technique, paper quality and so on. The sum of these choices create a unified expression that tells us something. It can be a parallel language to that of the content of the book and it can be more or less emphasized and thought-out. Some would say it could even be devious in its intentions. 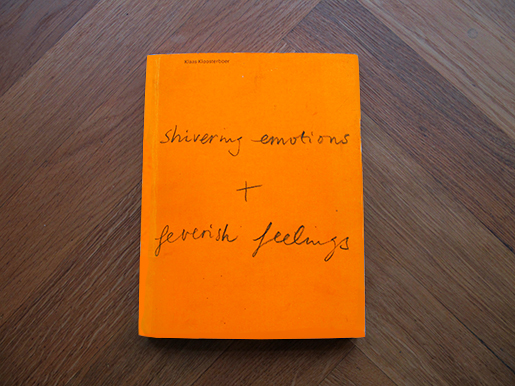 This is an exploration of the book “Klaas Kloosterboer: Shivering Emotions + Feverish Feelings” from a design perspective. It was published by Artimo in connection to Klaas Kloosterboers exhibition BALLAST at the Badischer Kunstverein. It is designed by the design office Mevis & Van Deursen. I interviewed Linda Van Deursen in connection to this essay to get further insights in the design choices and the conditions from which the book came to be. 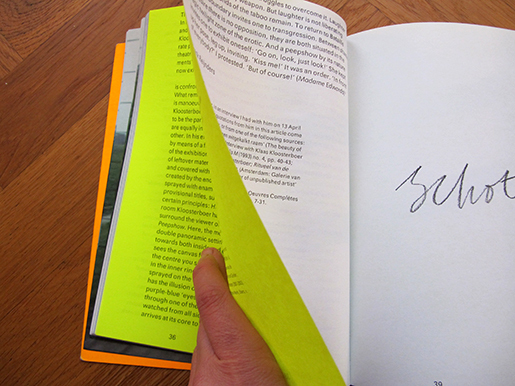 The cover consists of neon orange cardboard (around 300 gsm) with the title in what looks like Klaas Kloosterboers handwriting in pencil. The orange cover folds in to almost full width of the very first and last page. I learn from the designer that this is a technical solution to add steadiness to the book. It’s a signature bound soft cover, consisting of a broad selection of heavy stock paper which can result in a weakening of the soft spine unless it is reinforced. I’m thinking it could invite the reader to use the orange cardboard gate folds as an alternative page in any of the books 100 spreads. I learn from Linda van Deursen that the book is a sort of material archive or assortment of papers of a specific kind. A rule that she set up for the book was that only two sided paper (meaning the paper has a different appearance on each side) of the type used in posters and envelopes (because they can’t be see through) were to be used. Not only does this create an intriguing visual and physical experience but it serves as a kind of metronome or conductor where the different surfaces of the paper are altered rhythmically but not predictably (you learn the rhythm and then it alters). 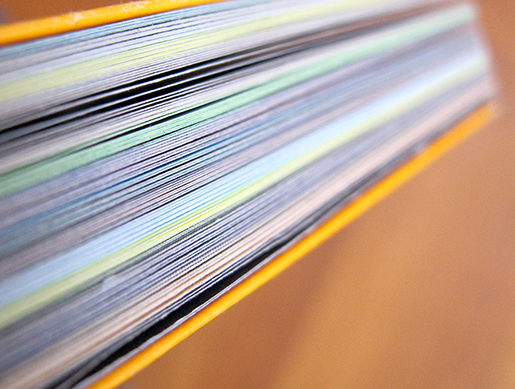 This feature creates a playful element to the structure of the book. 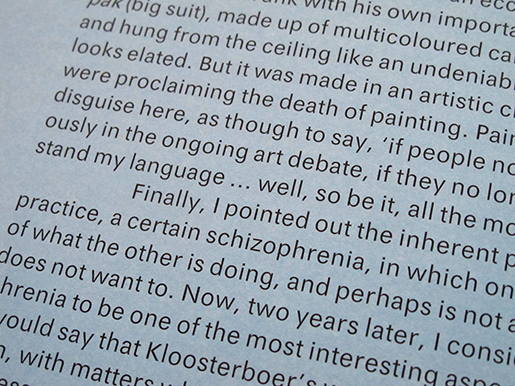 For example in the sections that consist of photos of Kloosterboers work, the reading sequence is ACBD where A and C are overviews of two different artworks and B and D zoom in on the same two images. But because of the rule of the two-sided paper rythm, this seemingly logic and rigid set up completely changes. In addition to this, all rules seem to be broken at least a couple of times in the book which is a testimony to the sure instinct and playfulness of the designer. The text is set in EF Maxima. 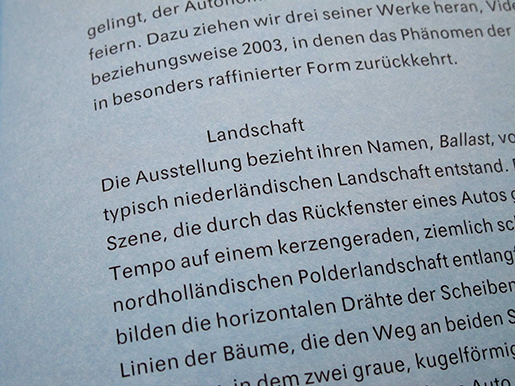 This sans serif is used in two contrasting ways throughout the body of copy. The left hand pages are in English and set in larger size (approximately 12 pt) and narrower leading which results in a more contemporary expression. The tracking is on the plus side of the spectrum, perhaps around 10. The right hand side has the same tracking but is smaller in size (approximately 10 pt) and more importantly its leading is much bigger which leads to a surprisingly conservative appearance. This is a demonstration of how drastically you can change the meaning of a typeface with small means. It also solves the problem of fitting the German language in the same amount of space as the shorter English text. There’s a lot of trends in typography and it is hard to define what a typeface communicates without looking at its context and treatment. Also, the way a typeface is repeatedly used will change how we read it. This could mean that a typeface that was originally designed with utilitarian intentions can end up being perceived as elitist or exclusive. EF Maxima was originally developed by Typoart as a substitute for Helvetica. Typoart was a government owned, east german type foundry that was privatised in 1989 in connection to the unification of Germany. If we ignore the complex political situation in that area at that time, and just see Maxima as a typeface created with similar intention as Helvetica but without the same exposure, then I think we could dare call it a humble and uncommercial font. This could be illustrative of the intention behind this design. Because it is clear that Van Deursen is not concerned with selling commodities or increasing value to art galleries through slick design. All the design choices are closely connected to the subject that is the artist. I think this explains why the book still seems so relevant in its form.